"The murder rate in 2015 experienced its largest single-year increase in nearly half a century. In Chicago, more than 4,000 people were shot last year alone – and the murder rate so far this year has been even higher," President Trump said. The Facts: Trump's numbers here are all correct, including the number of people shot in Chicago, according to the Chicago Tribune. The nation's murder rate did see its biggest jump in half a century — 10.8 percent by the FBI's math — but it's worth noting that crime is also still near historic lows. 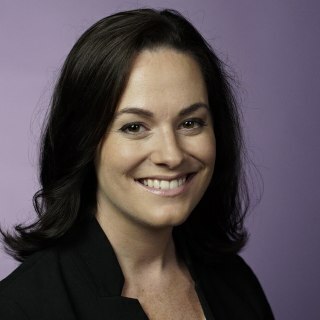 Crime overall is also at near-historic low levels, and crime experts told NBC News that the percentage fluctuations are larger because the crime rate is so low. 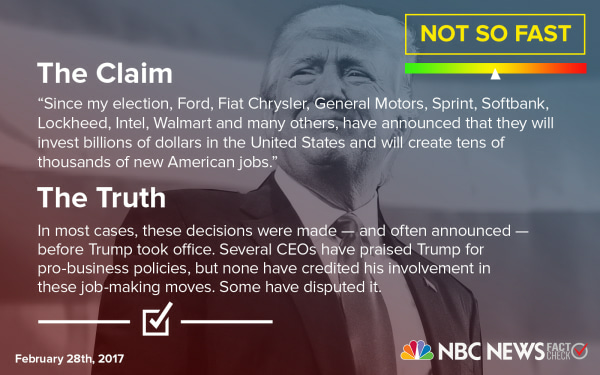 Fact Check: Trump Takes Credit for Companies Bringing Back or Keeping Jobs in the U.S.
“Since my election, Ford, Fiat Chrysler, General Motors, Sprint, Softbank, Lockheed, Intel, Walmart and many others, have announced that they will invest billions of dollars in the United States and will create tens of thousands of new American jobs," President Trump said. The Facts: Not so fast. Trump routinely overstates his involvement in these announcements. In most cases, the decisions that created jobs were made — and often announced — before Trump took office. Several CEOs have praised Trump for advocating pro-business policies, but none have credited his involvement in brand new, job-making moves. Some have outright disputed it. "I wish I could give him credit for this," Fiat Chrysler CEO Sergio Marchionne said recently. "But the thinking was in place beforehand." Lockheed Martin's jobs were part of a deal to grow fighter jet production for the U.S.; Intel had announced the jobs weeks before Trump took credit for it; Softbank's investment was announced weeks before the U.S. election. “According to data provided by the Department of Justice, the vast majority of individuals convicted for terrorism-related offenses since 9/11 came here from outside of our country. We have seen the attacks at home — from Boston to San Bernardino to the Pentagon and yes, even the World Trade Center," Trump said. 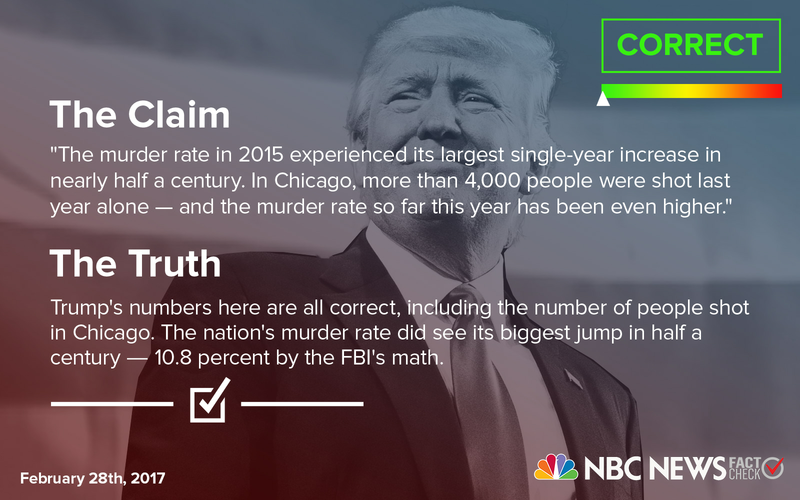 The Facts: It’s unclear which data Trump is actually citing. Lacking the DOJ data Trump cites, the Associated Press notes data from the Department of Homeland Security that indicates Trump is overstating the threat of foreign-born individuals. Just over half of the people convicted for terrorism-related offenses since 9/11 are foreign born. The rest were born in the United States, including some of the perpetrators of the attacks Trump cited, including San Bernardino shooter Syed Rizwan Farook and the shooter in the Orlando nightclub attack, Omar Mateen, who was born in Queens. “We have cleared the way for the construction of the Keystone and Dakota Access Pipelines — thereby creating tens of thousands of jobs," President Trump said. The Facts: A 2014 State Department estimated last year that the two pipelines combined would create a 16,100 temporary construction jobs, while 26,000 jobs are expected to come from contractor and employee spending (think the fast food worker who serves construction workers breakfast). Less than 100 are expected to outlast construction, according to the State Department and a Brookings Institution estimate. “According to the National Academy of Sciences, our current immigration system costs America's taxpayers many billions of dollars a year," President Trump said. The Facts: Estimating the cost of immigrants is tough, but the study Trump cites on immigration found that first-generation immigrants do cost taxpayers about $57 billion a year. However, second and third-generation immigrants become a boon to government coffers, adding $30 billion and $223 billion dollars a year. The report said immigration was “integral to the nation’s economic growth,” and particularly praised high-skilled workers, who create jobs and have a significant “positive effect” on the economy. "I just spoke to General Mattis who reconfirmed that, and I quote, 'Ryan was a part of a highly successful raid that generated large amounts of vital intelligence that will lead to many more victories in the future against our enemies,'" President Trump said of the raid in Yemen that killed Navy SEAL Ryan Owens. NBC News Investigations' reporting disputes this claim. Multiple sources, including senior U.S. officials in different parts of the government with knowledge of the situation, told NBC News that last month's deadly commando raid, the first of its kind approved under Trump, has so far yielded no significant intelligence. But as NBC reported yesterday on "Nightly News," Department of Defense officials and military officials push back on that and insist they have obtained "significant intelligence," including data on explosives, according to a senior U.S. official cited by the AP. "Obamacare is collapsing — and we must act decisively to protect all Americans," President Trump said. This depends on your definition of "collapsing." More than 9.2 millionpeople signed up for Obamacare for the 2017 coverage year and more than 20 million now have coverage because of the law's provisions. Premiums on the Obamacare exchanges are going up: They rose by an average of 22 percent this year, but a recent report found that was an in part expected adjustment because the premiums were artificially low the year before. Health insurance premiums had been rising long in all sectors before the ACA became law. But that doesn't mean that insurers aren't worried. Insurers say they're struggling to make money and that they've been hurt by expensive customers who use special enrollment periods to sign up for coverage only when they need help paying big medical bills. Despite its flaws, polls have indicated that voters want to keep many, if not most, aspects of the law. They like provisions that stop insurers from capping benefits, refusing to cover people with preexisting conditions, and allowing adult children up to age 26 to stay on their parents’ policies. 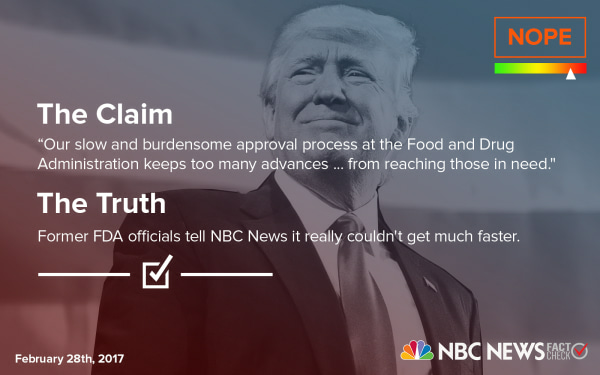 Fact Check: Can Trump Really Speed Up FDA Approvals? “Our slow and burdensome approval process at the Food and Drug Administration keeps too many advances, like the one that saved Megan's life, from reaching those in need,” President Trump said, speaking of a young woman living with Pompe Disease who was in the audience. "If we slash the restraints, not just at the FDA, but across our government, then we will be blessed with far more miracles like Megan." 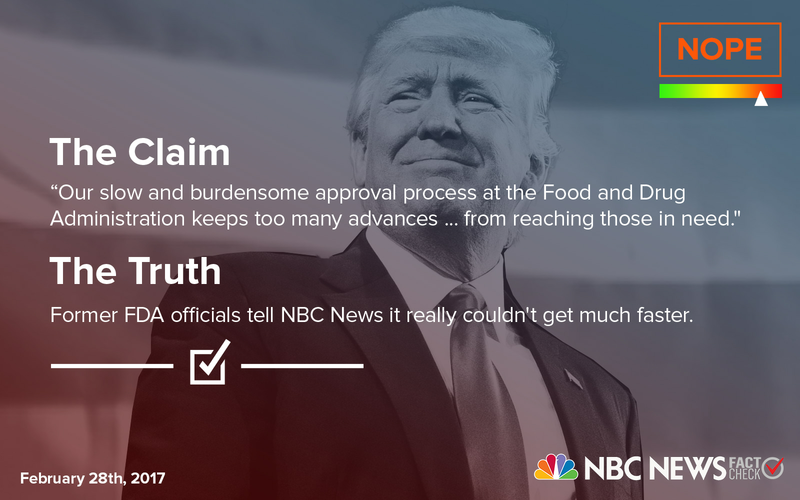 The Facts: Former FDA officials tell NBC News that the process has already been streamlined, and can't get much faster. "Every administration for the last 40 years has talked about speeding up drug approval," Dr. David Kessler, who headed the FDA in the 1990s, told NBC News this month. "The reality is that we're the fastest in the world. If you get sick … chances are if you live in the United States, you are going to have access to a drug first. It's going to be approved first in the United States. 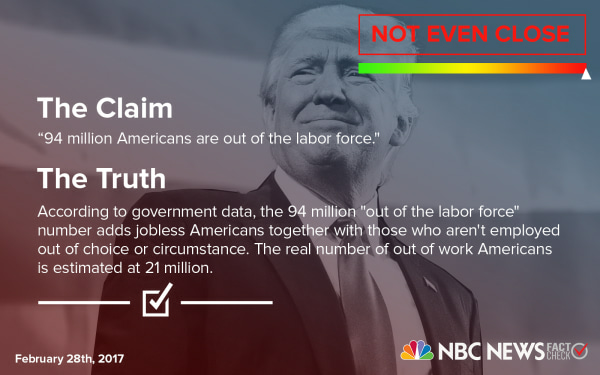 Fact Check: Are 94 Million Americans Really Out of the Labor Force? “94 million Americans are out of the labor force. Over 43 million people are now living in poverty, and over 43 million Americans are on food stamps," President Trump said. 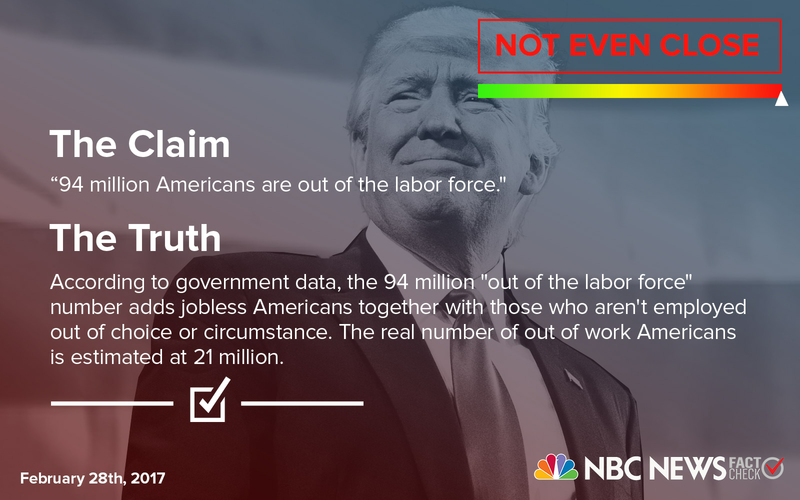 The Facts: The labor force number is technically correct, according to the Bureau of Labor Statistics, but extremely misleading. He's adding together out of work Americans with those who aren't working out of choice or circumstance, including everyone from high school students to disabled Americans to retired seniors and stay-at-home moms. According to PolitiFact’s careful math, the real number Americans who are out of work and in the job market is 21 million, a quarter of Trump's number. He is correct to say that 43 million are on food stamps and in poverty. Fact Check: Did Trump Really Save the U.S. Hundreds of Millions on Fighter Jets? 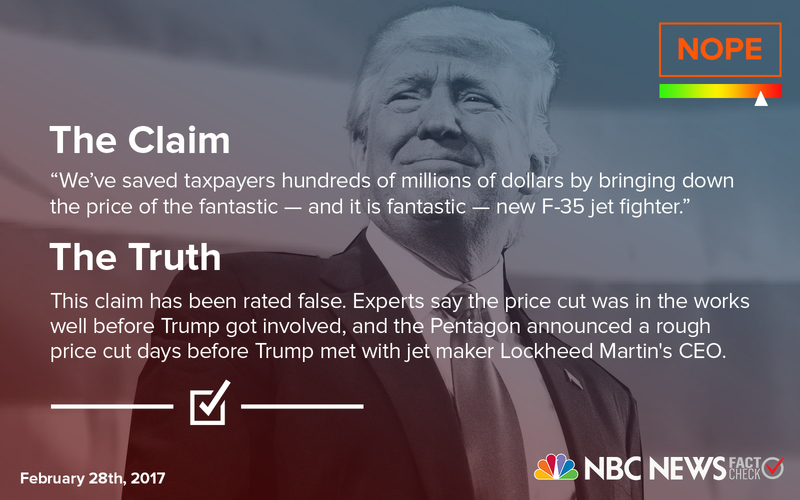 “We’ve saved taxpayers hundreds of millions of dollars by bringing down the price of the fantastic — and it is fantastic — new F-35 jet fighter,” President Trump said. The Facts: Experts say the price cut was in the works well before Trump got involved, and the Pentagon announced a rough price cut days before Trump met with jet maker Lockheed Martin's CEO. PolitiFact and the Washington Post rated this claim mostly false and false.